Brethren of the Blackpool Group are based only a stone’s throw from the Opera House Theatre at the Winter Gardens in Blackpool, venue of the Provincial Grand Lodge meeting at which 1,200 Masons assembled to celebrate their colleagues receiving Provincial honours from Provincial Grand Master Tony Harrison. 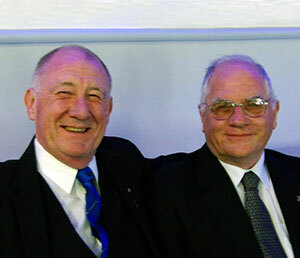 Gordon Smith PrSGD (left) with Tom Inman PPrSGW. On the stage that has hosted iconic entertainers of such distinction as Frank Sinatra, Judy Garland, George Formby and Peter Kay, the Provincial Grand Master honoured fellow Masons in a magnificent spectacle of Masonic ceremony. Cheerily welcoming and congratulating each recipient, Tony honoured some 357 Masons with first appointments or promotions. Now in its third reincarnation, the modern-day Opera House, designed by Charles MacKeith, was opened in 1939 and has been described as ‘a masterpiece of theatre design’. The first Opera House was designed by the legendary Frank Matcham, responsible for some of the most iconic theatres across the UK, including the Grand Theatre only a short stroll from the Opera House which was opened on 10 June 1889. The Opera House was the venue of the first Royal Command Variety Performance to be held outside London in 1955, and more recently in 2009. Consequently, there could not be a more prestigious venue in which to honour Freemasons from across the Province of West Lancashire. Pictured from left to right, are: Dryden Hyde PrAGDC, Martyn Jones PPrJGW, Chris Walpole PPrDGSuptWks, David Jones PPrDGSuptWks and Graham Kenyon PrGStwd. All honours presented and the congratulatory applause having subsided, the throng retired for a few celebratory refreshers before rounding off the day in the equally opulent surroundings of the Spanish Suite where many wined and dined at the sumptuous Provincial Banquet. The day had been a major success and the brethren celebrated to the full. There is no doubt that it was a glorious day of honours, filled with pride – regardless of whether one was a recipient or a spectator.